When it comes to discussion about a theory in dispute, Science Friday usually has a couple of panel speakers come together and debate the issue, but this segment was just a straight interview with Dr Berger. The good thing about the interview was that they discussed both sides of the Hobbit debate without leaning to any conclusions, and so it didn’t seem to me as if any particular agenda was being pushed. Berger’s main point was that the Palau skeletons – given that they are 2,000 to 3,000 years old – seem to indicate that human populations placed in a confined enough environment can possibly develop island dwarfism and display traits of primitivism seen in earlier hominids (perhaps, a kind of regression?). Apparently, there are other similar deposits of skeletons in the archipelago, and perhaps spread throughout the islands of the pacific. 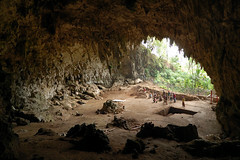 The dating of the Palau skeletons also place them firmly within the expansion of Austronesian-linguistic groups from Taiwan to island Southeast Asia and the pacific islands, which would indicate that the Palau Pygmies may be a lot closer related to Southeast Asian populations than we think. I wonder if there can be any genetic comparisions made between the Palau skeletons and the rest of the Austronesian population. Also, how is the existing population of Palau related to the skeletons?